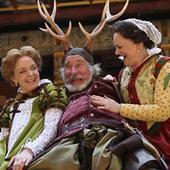 The very successful production from 2008 of The Merry Wives of Windsor returns to the Globe prior to touring abroad to Santa Monica, New York, and in the UK to Milton Keynes, Norwich, Richmond and Bath. This play was reportedly written for the Queen Elizabeth I, who expressed a desire to see more of Sir John Falstaff, the wayward knight seen in the history plays Henry IVs and whose death is described by Mistress Quickly in Henry V.
Charlotte Loveridge's review holds good and expresses the flavour of the production far better than I ever could. The costumes are fabulous and the fop Abraham Slender (William Bedchambers) with his oversized white ruff (think a serving plate for a large joint of beef only in this case it is his head which is being served up) and lime green tights and cross woven tomato and lime banded sleeves, steals the sartorial honours. There are other design surprises with the pop up garden with real flowers and the magnificent Woodland straw costumes for the final act. I enjoyed too Ford's zenophobia when he says, " I will rather trust a Fleming with my butter, Parson Hugh the Welshman with my cheese, an Irishman with my aqua-vitae bottle, or a thief to walk my ambling gelding, than my wife with herself:" Being about Falstaff there are plenty of references to Elizabethan food and drink in this English social commentary of Shakespearian comedies. I liked to the authentic musical instruments, Sackbut, Theorbo, Cittern, Alto Shawn and Alto Curtal, Mark Tree and Nightingale for those who collect instrumental rarities. The use of music is witty with romantic music played whenever any allusion is made to love. Of the performances I would single out Andrew Havill as the jealous Frank Ford who is often called upon to teeth clenchingly pretend he is not concerned at the planned seduction of his wife by Sir John. This is the first time The Merry Wives of Windsor has been performed at the Globe and already it is said to have won more interest from patrons than the rest of the season. From the same creative team which brought us the very silly, very successful Comedy of Errors two years ago, Christopher Luscombe again brings out the glorious hilarity of this social farce with all the freshness of a rarely-performed Shakespeare. Brimming with energy and life, this production positively revels in the pseudo-adulterous intrigues in and all the frolics and gambols of Henry IV without the politics. Set in a society ostensibly dominated by foolish, suspicious males but in fact run by a conclave of sensible yet fun-loving females, the purely domestic scope of the play is widely described as pre-empting the sitcom genre. The bourgeois realism of the play, with marital love plots and relationship dramas, is here lovingly directed with explicated comedy and a sense of traditionalism. Particularly charming is the notorious laundry basket episode, pulled off with precise comic timing and novel portrayal. Concealing the errant Falstaff (Christopher Benjamin), the servants hurt their backs attempting to lift the basket and the wives belch to disguise Sir John's groans. The intelligently apt design by Janet Bird plays to the comedy's sense of Elizabethan middle-class domesticity. With the facade of a Tudor house in the background, the bridged, extended set curves out into audience with a suburban shrubbery, like a pleasant, landscaped garden. Picturesque in a conventional, homely way, the outpost of the stage is overturned during the fairy revels to show the Windsor Forest oak. The sequence is then played as a masque, with all the traditional grotesquery, including costumes with outsized fish heads and outrageously unkempt straw cuffs and ruffs. Traditional music composed by Nigel Hess and period costume add to the late sixteenth-century atmosphere. The cast are well-gelled and appear to enjoy the play as much as the audience. Mistress Page (Serena Evans) and Mistress Ford (Sarah Woodward) are delightful as the sharp-witted old friends quietly, deftly running rings around the men. Christopher Benjamin's Falstaff has his obligatory, protuding belly clothed in luscious fuchsia velvet and he sports impressive mustachios. He is magnificently deluded in his arrogance and hyperbole, even if he lacks the genial sparkle of David Warner's recent incarnation. Wil Belchambers was farcically camp as the malapropism-prone Slender, wearing a pair of splendid green tights, as if someone had taken a highlighter pen to his legs. Also hilarious was the Frenchman Dr Caius (Philip Bird) who garbles his English to uproarious effect. The Merry Wives of Windsor is certainly silly but it is Shakespearean silliness and reflects the bard's original populist appeal. Its themes of trust and jealousy, conniving, hoaxing stratagems, and the hopelessly inflated male ego are sure to appeal to a modern audience, even without the inadvertent civil contracts required by the plot. With a clear-cut comedy which works well in the Globe's space, this is not exactly challenging but an accomplished production of a diverting and fun play.